Rheumatic diseases are among the most frequently encountered problems in primary care practice. The aim of this issue is to provide primary care clinicians with the tools they need for treating these disorders in every day practice. 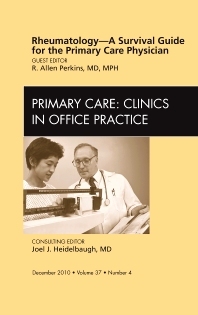 The issue focuses on the diagnosis and treatment of common rheumatic ailments such as osteoarthritis, fibromyalgia, rheumatoid arthritis, and systemic lupus erythematosis, emphasizing the practical, hands-on approach that primary care doctors find most useful.